Microsoft and Apple have both taken their respective approaches to Desktop and mobile computing, but Ubuntu takes a radically different way of thinking about it with their Unity engine. While Microsoft has notoriously tried to fuse desktop and tablet type operating systems into one OS (Windows 8.1) by having two separate modes and Apple has chosen to have separate OS’s for desktop and mobile computing (OSX and IOS respectively), Ubuntu runs with the idea that their OS will not only run on everything but also look and feel the same on any device you run it on. So while certain versions like Ubuntu Touch will be optimized for mobile chips, it will still look like the desktop version. That means the interface itself has to be very minimalistic at first glance, but peels away at numerous easy gestures or keyboard shortcuts to reveal an array of complex functionalities. 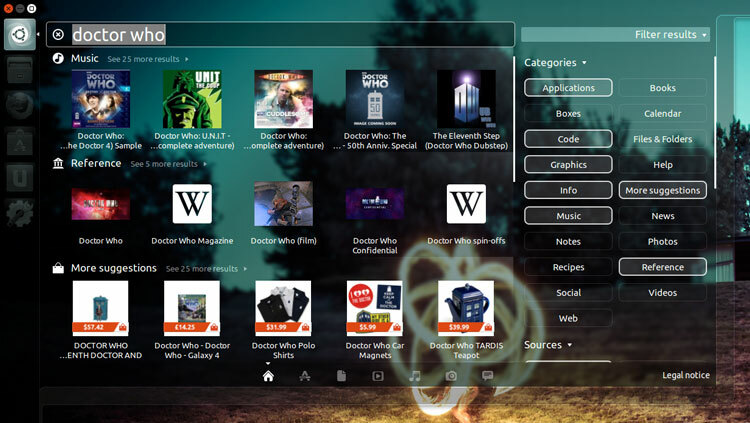 Ubuntu carries out this arduous task by using a space saving launcher to the left which has a set of applications that are ‘locked’ into it for easy access and displaying an icon for running applications. A set of indicators to the left and right of the icons indicate how many instances of an application is open and which one is in focus. 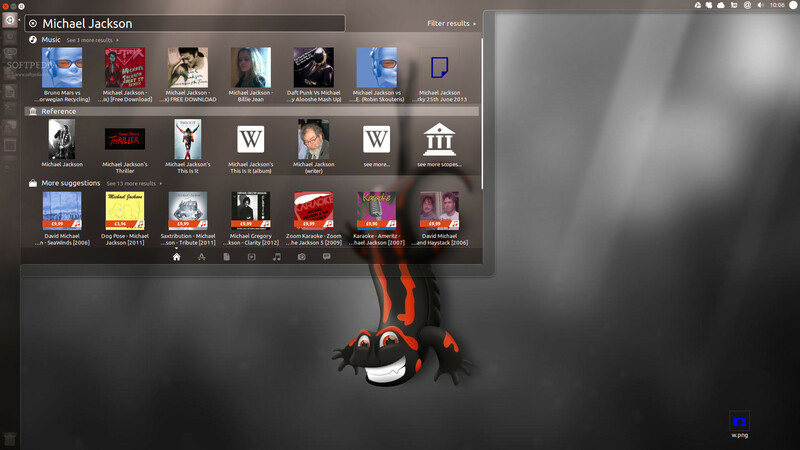 On the top is the menu bar which shows all indicators such as weather, messages, etc. and options for the activated application as well as the capture bar that includes close, minimize and maximize buttons. All of the above is just a way of making current things more efficient; borrowing from Mac, Windows and even Android but one thing that I found really innovative was the concept of the dash. The dash is basically an all in one search system. When you type in a set of keywords, it automatically does a local and Internet search pulling up all relevant results. Firstly it returns your applications and then folders each limited to one line of icons with buttons for expanding the selection and then the Internet results are displayed as they trickle in so it doesn’t hamper your productivity when looking for a file or application. Since Saucy Salamander 13.10, the net search gets really interesting; it’s not like a Google search or something like that resulting in a list of links, but rather a search is done based on the activated scopes, which are basically places for searching. That means that if you search for a book, an Amazon entry may be returned while music will direct you to the song in the Ubuntu one music store. You can even search through your Facebook contacts, messages, files in Google drive and so on so forth, just by typing into one bar with no need to open anything else beforehand. This search bar reduces time that is spent in browsing from site to site making the experience faster, fluid and more intuitive. Not only that, but you can use graphical filters on the right to narrow your results or just type filters into the keywords themselves. The dash is always present on the top of the launcher and can be activated by using the <Super> key. Another really helpful concept is the HUD. Essentially, you press <alt> to open up a search bar which can search through all the menus and options available in the focused application. This feature can be really helpful either if the application has a lot of options like and IDE(integrated developing environment) or if you know a feature is there but you’ve forgotten under which menu it is located. Say, to use insert a page count you could type that in instead of manually locating it through the numerous menus which is a time consuming task to say the least. All of these searches happen as you’re typing, speeding up the process even more. To make all versions look identical, the basic interface has to be able to run on very little resources because some devices may not have access to high end rendering. That, by no means mean that the interface isn’t visually appealing, but rather it’s a beauty to look at: on par with Windows or OSX. The fact that it consumes so little resources means that odds are your computer will speed up a lot, not to mention the fact that it makes all animations more fluid and thus awesome. 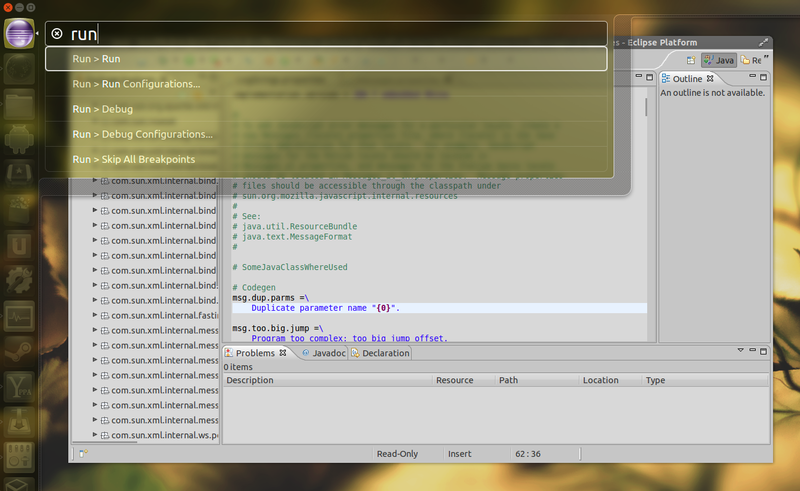 Ubuntu comes with a lot of useful bundled software, one of them being the empathy messenger. This combines all your accounts into one unified interface and can work with all popular desktop messaging systems, including Facebook, Google Talk and Yahoo. All the messages end up here and you can see who is on line on which network at a glance; reading, replying and ignoring messages from one window. This links to the notifications in the top menu bar and the dash, making any new messages even easier to access. 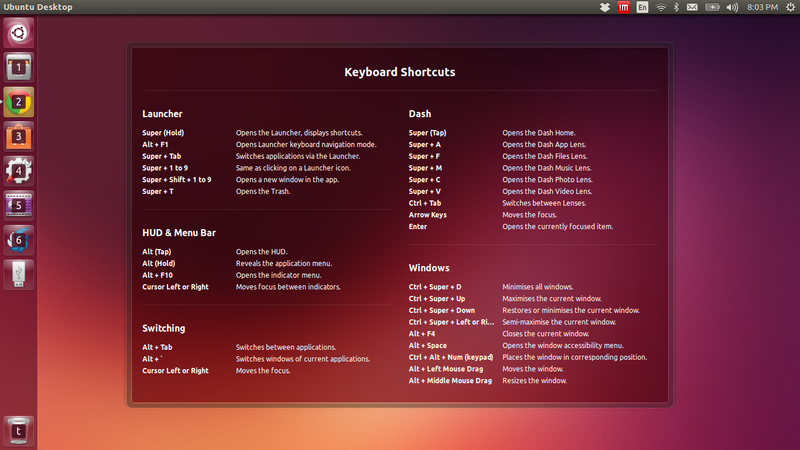 Finally, installing software on Ubuntu is easier than ever before. 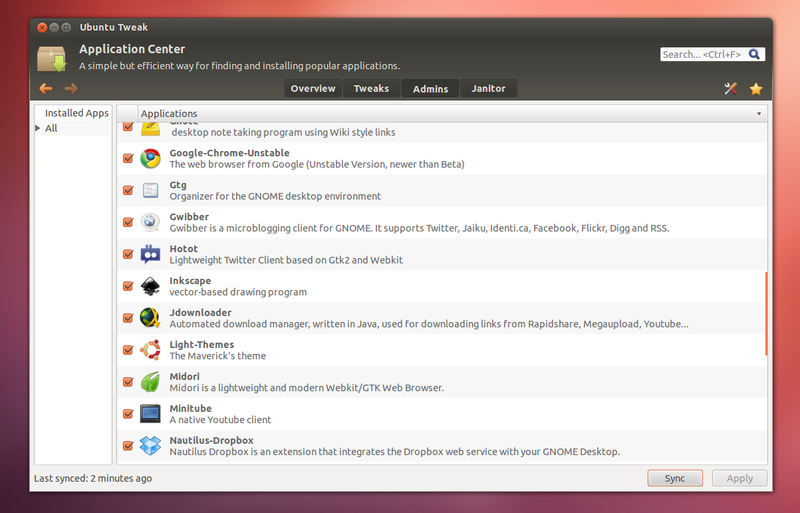 All you have to do is go to the Ubuntu Software Center from the dash, search for the application and click install. Thats it. It’s as easy as that, and this is for all software, not just the touch friendly ones as in the Windows store. 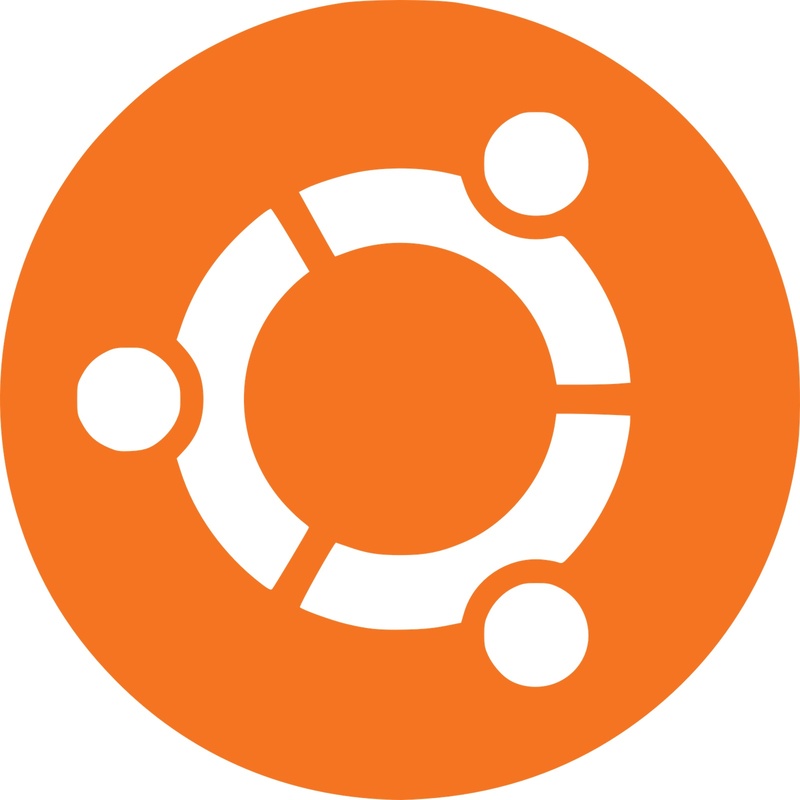 I recently switched over to Ubuntu from Windows 7 and I haven’t regretted it since. My system is a lot faster and much more smooth. It now uses 25% of my RAM after booting, as opposed to Windows which used 70% and runs all the benchmarks faster. I really like the new interface since the focus seems to be on cutting down on wasted time and space, keeping the desktop clutter free and making sure I can find what I need as soon as I need it. Once you’ve mastered the keyboard shortcuts (a list is displayed by holding the <Super> button), the speed of navigation across the entire interface increases dramatically further reducing the time to do what you need done. Booting and shutting down is really fast too, although not quite as fast as Windows 8’s hybrid boot. I thought I’d miss the Windows’ software, but WINE lets me run everything major including Adobe CS6. Try out Ubuntu, I don’t think you’ll want to go back. I’m basically your average teenager who’s a little screwed in the head. Okay, maybe not just a little. I love computers and pretty much everything tech, so I end up spending a lot off time messing around with the settings or programming and try to stay updated with what’s new in the tech world. Other than that, eat: a lot. I also read a lot of books, watch anime and read manga. So yeah, the term geek defines me pretty well.